If you rig has an IF output on its back panel then you have almost everything you need for WriteLog to superimpose a waterfall display on its Band Map. There is no need to buy an expensive panadapter, and you get packet spots on the same display along with all the detailed customization like horizontal versus vertical orientation and selectable update rates and resolution. 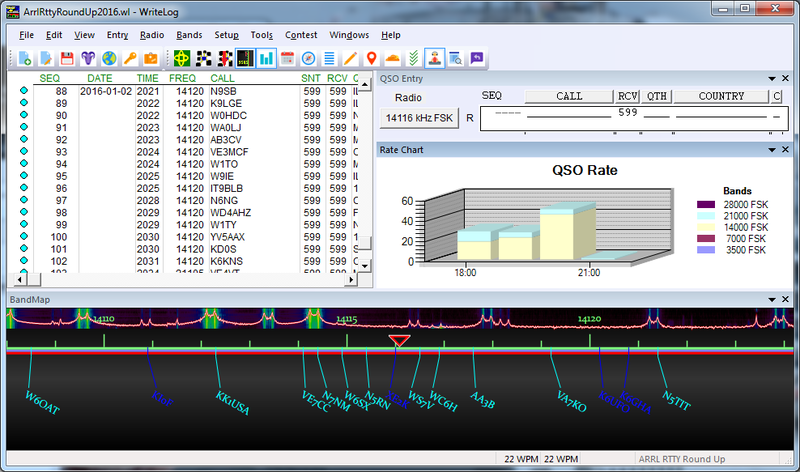 The screen shot was during a RTTY contest, but it works for all modes. The funcubedongle is the most expensive solution at just under $200 US, but also the easiest to setup. It has an SMA input to connect to your rig’s IF, and its USB port auto-magically installs a Windows “Recording Device”. You’ll need the ExtIO dll compatible with HDSDR/WinradHD as well. The ExtIO dll downloads are listed here. The RTL-SDR has the same physical connections as the funcubedongle: an SMA for RF input and USB for the PC. And its only about $25 US on Amazon. But the software setup is more complex. You’ll need to install open source kernel mode drivers, as documented on the RTL-SDR website, from http://zadig.akeo.ie/. I do not automatically trust downloaded kernel mode installers; you’ll need to make your own decision about whether there are any risks. I did my testing on a machine with nothing I was afraid to compromise. And you’ll also need the ExtIO dll from here. The Softrock SDR is a kit for about $25.00 and does NOT come with an enclosure or power supply. Its only good for IF’s up to about 10MHz. You have to know your rig’s IF frequency and order a suitable crystal for it. I bought a small box for mine, big enough for the circuit board as well as a 4 cell AA battery and on/off switch. Its output is stereo analog suitable to plug into the line in of a sound board. For all the above, you’ll need to run WriteLog’s Setup/SDR to configure WriteLog to use the device. You’ll need to know your rig’s IF frequency range. If your rig doesn’t have an IF output, it may be possible to easily add one. I was able to do so with both an Elecraft K2 and a Yaesu FT-1000MP.